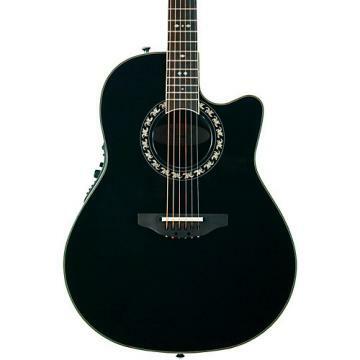 The Ovation Custom Elite C2078 AX Deep Contour Acoustic-Electric Guitar features a hand-selected, premium AAA solid-spruce top with LX scalloped bracing. The guitar's Deep Contour Bowl composite body maximizes acoustic output and is ergonomically designed for comfort in any playing position. 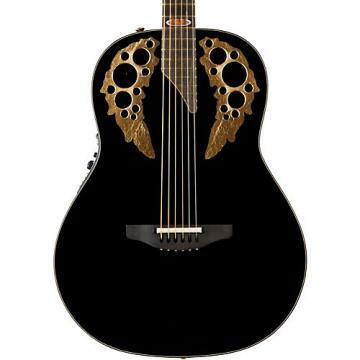 Ovation's pioneering multi-soundhole design enhances string vibration and sustain by improving soundboard efficiency. A cutaway offers full access to the gloss-finished, 5-piece mahogany/maple neck. The guitar boasts hand-inlaid abalone appointments, an ebony fretboard and bridge, and upper-bout soundholes decorated with exotic hardwoods. With its onboard compressor, the OP-Pro Studio preamp enhances strummed chords, fingerpicked arpeggios, and single-note solos. Dual XLR and ¼" output jacks connect the Custom Elite to virtually any sound system, stage amp, or recording console. Great guitar, I absolutely love it. Nothing sounds like an Ovation on the stage. Crisp, Clean, Rich sounding with on board eq. and a great compressor. Only downside is that to use the XLR out you have to have a 1/4 plugged in to activate the pre-amp or buy/make a custom XLR cable with a grounded shell to activate the pre-amp. Unfortunately, I had to research this on my own to learn this because no documentation came with the guitar. Even still, would highly recommend this guitar for anyone wanting top notch live acoustic sound ! .I would highly recommend this instrument.